Happy Book Birthday to OF LOVE AND CORN DOGS! Hi there! Today I’m so excited to share a review for a new contemporary M/M romance out today from Parker Williams. 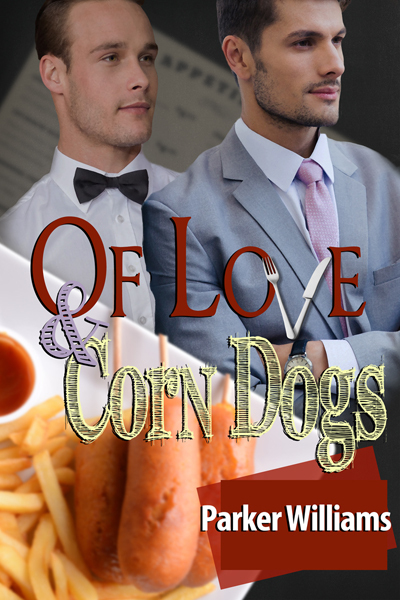 OF LOVE AND CORN DOGS is a an odd couple romance between a young waiter and the billionaire he cheers up at a restaurant. It’s very sweet with a little bit of steam. Darwin Kinkade is a billionaire CEO running his family business and being a decent human. He’s out, and always has been, but hasn’t dated any man since his first love and former husband, Dean, died of cancer six years ago. He takes a little salacious pleasure in observing his favorite waiter at his standing reservation–and is upset when that man doesn’t show one evening. Ricky, the replacement, is kind and attentive, in a way that disarms Darwin, and gets him moving out of his workaholic comfort zone. Ricky is a frugal student making ends meet as a waiter. He’s subtly charmed by prickly Darwin, especially when Darwin returns to his restaurant with a special meal: corn dogs–recommended by Ricky and previously untried by Darwin. They share a meal, and a night out, but neither is willing to push for more. Ricky’s always liked to move slow, and Darwin isn’t sure how to get started. As they develop a closeness, and continue dating, Darwin decides he doesn’t want to tell Ricky about his money. He likes that Ricky seems to like his personality, and he’d been schooled by his parents that “money changes people.” It’s also his experience, and he knows that Ricky is a very proud man; he fears that Ricky will think they are too different to stay together if he learns the truth. Naturally, the truth comes out–and I liked how that happened. It was very honest, and the reactions were also genuine. It was upsetting for Ricky, and left him feeling less-than-worthy due to their great income inequality. I really enjoyed how the secondary characters in this story felt so real, and how they weren’t afraid to call Ricky or Darwin on their nonsense. Each MC has a loving and accepting family, and those relationships are a big part of the narrative. Expect a break-up-to-make-up scenario that’s very sweet and full of tears, and a wee bit o’ primo scotch. And, there’s a bit o’ steam but you gotta wait for the end. The HEA is full-on with the stage set for another book featuring Darwin’s bestie, Hensley. I look forward to it. Interested? You can find OF LOVE AND CORN DOGS on Goodreads and Amazon. Good day! We are the voices that live inside Parker Williams’s head. The ones who whisper to him constantly, beckoning him to speak of our adventures, to tell of our love, and perhaps, if we’re in a mood, kill a person or two. We hope you will join with us as Parker fulfills his obligation to ensure our stories are told and, we hope, enjoyed. You can find Parker on his website, twitter and Facebook.